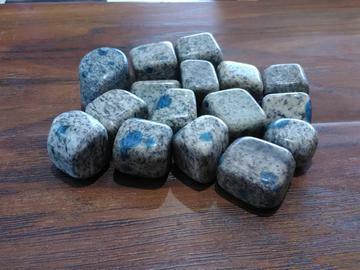 K-2 Jasper is a newly found and quite unusual stone. It was discovered, in the foothills of the worlds second highest mountain, Mount K2, in the Karakoram Range in Pakistan.Not sure whether the blue dots are either Afghanite or Azurite. K-2 Jasper is used for treament of headaches and migraines. It also helps to strengthen the bones. It is also good for those with Obsessive Complusive Disorder.